Industry standards have been established to ensure performance, consistency, and interoperability between network equipment vendors. However, the consistent implementation and operation of these standards become even more critical as speeds and bandwidth increase. At the fiber infrastructure level, this also means more testing may be needed beyond the basic fiber end-face inspection certification and Tier 1 testing. This white paper explores Tier 2 optical time domain reflectometer (OTDR) testing and examines its relationship to Tier 1 testing and how inspection plays into both. 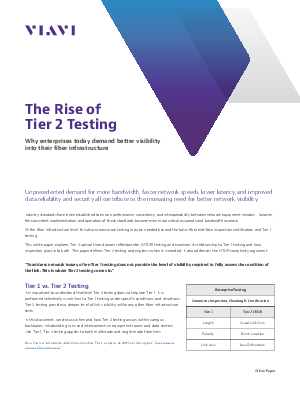 This paper defines Tier 2 testing and explains when it is needed. It also addresses the OTDR complexity argument.